In response to the incredible talent and determination of our players, we now offer a competitive 4 Pillars Elite Soccer Camp for players aged 11 to 18. This camp is for young athletes who are serious about their game and dedicated to increasing performance and success. They are ready to move to the next level, whether that means joining a more competitive team or playing in a more advanced league. Many of our athletes need advanced training for higher, more professional level play. BaxterSports knows Summer Sports Camps. Our dynamic, instructional programming has helped us win four consecutive awards from NW Kids Magazine as the best Summer Sports Camp in the Portland Metro area. Over our decade of success, we have watched our players compete at every level and some have even come back as coaches themselves. 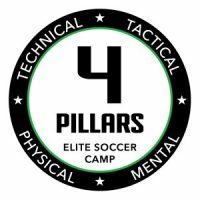 Our 4 Pillars Elite Soccer Camp combines our award-winning camp structure with a professional classroom curriculum to train young players in technique, strategy, mindfulness, and readiness. Participants should already have extensive experience in soccer, ideally on a competitive team. This program is designed to take serious players to the next level and get them ready to meet the demanding expectations of competitive soccer. Uncover your best and shine for the rest. First 2 Goalkeepers who sign up get $45 off! Contact brian@baxtersports.com for your coupon code. Brian Baxter, Founder and Director of BaxterSports, is not only a committed, highly successful soccer coach, he is also a Director at the Sport Psychology Institute Northwest, a cutting-edge service that combines performance on the field with mental preparedness and focus. In conjunction with Aaron Grub, Founder of Pursuit Soccer, Baxter has developed an intense, elite soccer camp for strong middle school and high school players looking to change their game and move to the next level of competition. The program is designed around four pillars of success: Technical, Tactical, Physical, and Mental. Each is addressed equally through classroom instruction and on-field play. The curriculum is enhanced by contributions from local Portland leaders in the fields of sports conditioning, nutrition, yoga, and injury prevention. 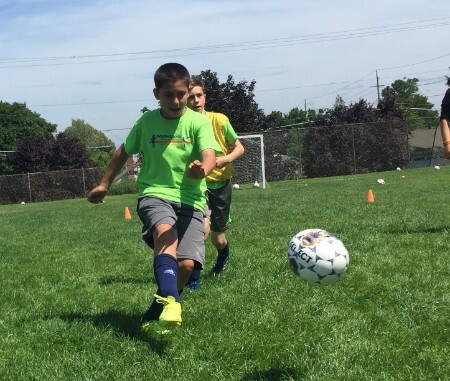 Our approach is holistic, recognizing that players today need more than exceptional skill to be competitive soccer players; they must be healthy, well-rounded, goal-oriented team-players. Our Competitive Camp is designed to help them achieve this. Our intense classroom sessions differentiate the BaxterSports 4 Pillar Elite Soccer Camp from other similar summer camps. We have designed a complete curriculum that trains our players in the Mental and Tactical strategies of soccer, beyond the Physical and Technical aspects of play. Classroom time is interspersed with outdoor sessions to encourage our athletes to understand the importance of work-play balance. Youth Sport Psychology compliments game-time strategy and each day our participants attend lessons on how to focus on the task at hand, how to activate positive goal visualization, and how to reduce anxiety. We present physical approaches like yoga conditioning as well as mental strategies. Our goal is to foster the well-rounded, competitive athlete in a challenging, but supportive environment. Each week-long Camp is organized by age so that players are working with similarly-prepared teammates, both physically and emotionally. A major portion of each day is spent outside running drills, speed training, and scrimmages. We focus on the individual player’s improvement as well as their increased sense of teamwork through full games and mini-tournaments. We also work outside on mindfulness practices like stretching and yoga, often overlooked, but key components in the regimen of a strong, competitive player. On the field, we practice and review the Technical, Tactical, and Physical aspects of competitive soccer. Specialized drills drive players to up their game, whether that means footwork, cardio endurance, or combination play. We plan and execute advanced plays both on the sidelines and in the game. Our highly-trained coaches lead players through physical training and recovery sessions. Sign up for the 4 Pillars Elite Soccer Camp Today! This 5-day camp is designed to address the technical, tactical, physical, and mental components of sports. Each of the Four Pillars are addressed equally through classroom instruction and on-field play.